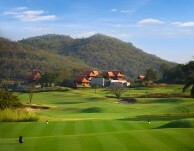 Built among a former pineapple plantation, Banyan Golf Club in Hua Hin opened in October 2008. 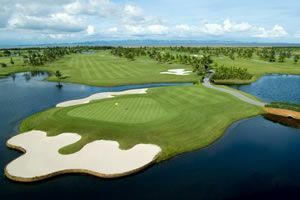 Immediately following, the course was awarded 2009 Best New Course in Asia-Pacific by the readers of Asian Golf Monthly. Since then Banyan Golf Club course, clubhouse, and staff have consistently claimed &apos;Top 3 in Asia&apos; awards and have been featured in the &apos;Rolex Top 1000&apos; in the World. 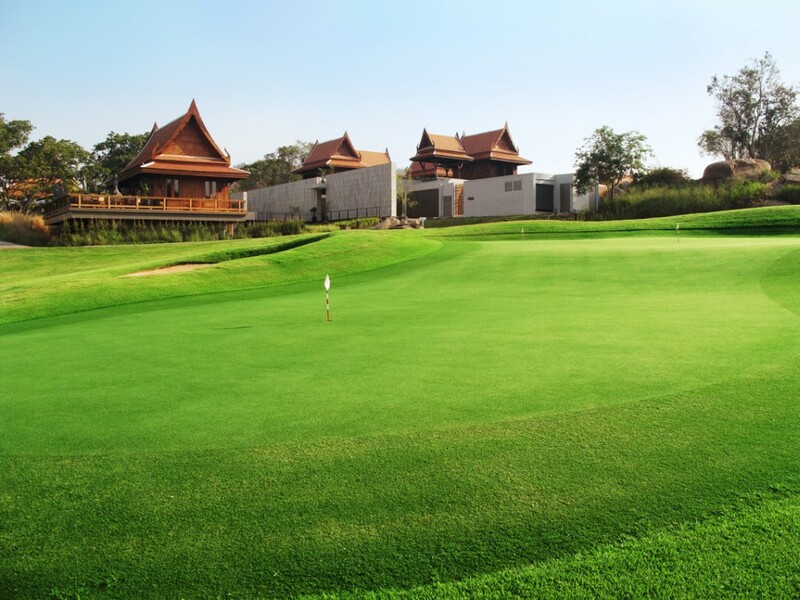 Thailand golf course architect Pirapon Namatra from Golf East designed the world class 18-hole championship golf course and is known to be one of the most natural in the country. 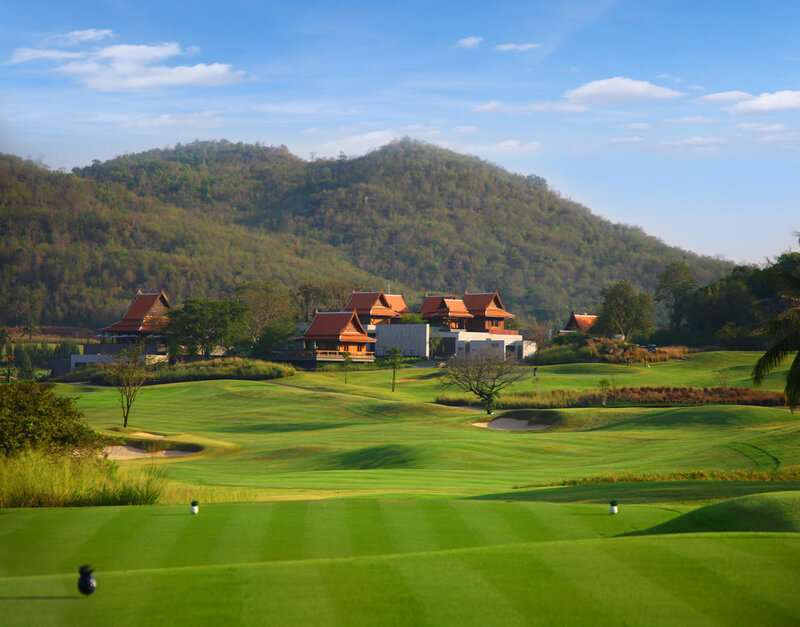 The course provides for spectacular mountain and ocean views from almost all of the holes and is one of the best layouts in Hua Hin. Each hole has six tee boxes making the course more or less challenging depending on each golfer’s ability and tee selection. Strategically placed water hazards, waste bunkers, and sand traps are spread out throughout the course. Significant use of native pineapple groves makes local fruits come into play if straying too far off the fairways. Be careful, pineapple plants are sharp and scratch easily. Lush Zoysia grassed fairways, a local grass but a rarely seen on golf courses in Thailand, are a pleasure to hit from as balls sit up nicely. Dark green Paspalum grassed tee boxes add to the stark color contrast on the course and are a nice decorative feature. Greens, constructed of premium Tiff-eagle Bermuda grass, make for fast and receptive putting surfaces and are well-maintained year round. 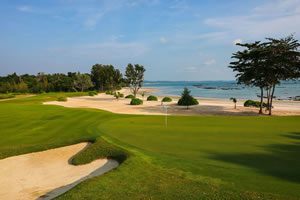 The signature 15th hole is a 139 yard par-3 with panoramic ocean views all the way to Singtoh (Tiger) Island in the Gulf of Thailand. Hole 12, a par-5 monster is 610 yards, all uphill, making it a challenge to reach for even the most accomplished of golfers. Other holes feature elevated greens, sloping fairways, meandering creeks and waste areas, and well-placed fairway and greenside bunker complexes. Practice facilities include a grass driving range and two large putting and chipping greens. 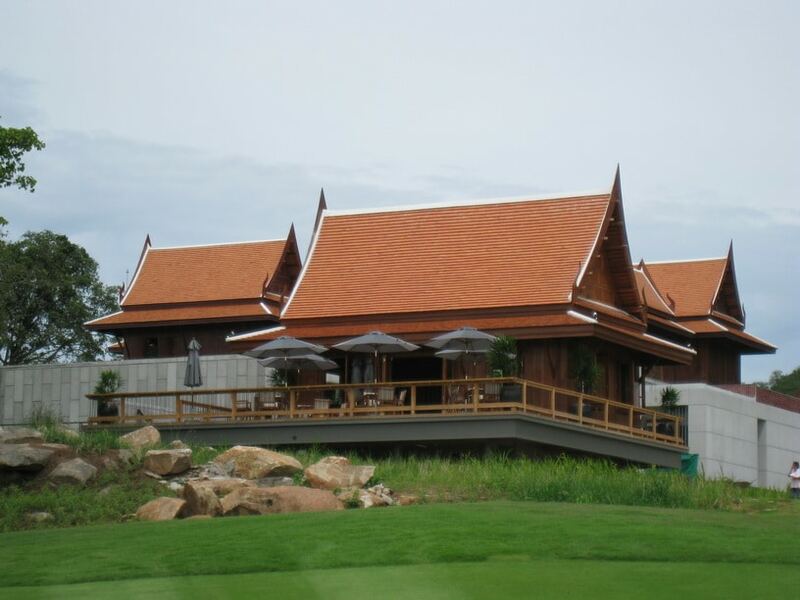 The Banyan Golf Club has a contemporary Thai styled clubhouse including, full reception area, well-stocked pro shop, elegant locker rooms, and two international restaurants; one of which are 5-star. Rain showers and luxury grooming amenities in the changing rooms round out the facilities. The Terrace Restaurant is an International all-day dining venue with a variety of Western and Thai cuisine and several daily specials. It also features a walk-in wine cooler with an excellent selection of fine wines to suit all connoisseurs. Mulligan&apos;s Pub, with western views over the golf course and Burmese Mountains, makes for an ideal way to have a few cold drinks, and take in a picture perfect Thai sunset. Walkers love the Banyan golf course, but for those who opt to ride, golf carts with onboard GPS are helpful. Caddies who are well-trained handle all of the usual services including making sure everyone who visits has a great day golfing at Banyan Golf Club. 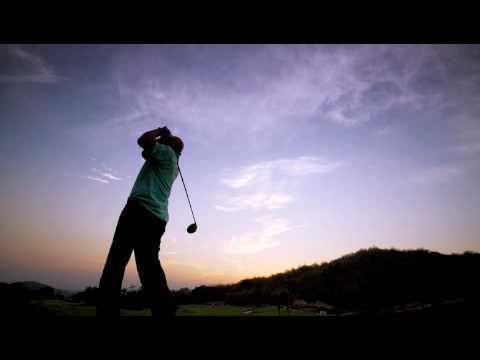 Have you played golf at the Banyan Golf Club and took some nice photos that you would like to share with other golfers? Send them to us and we may upload them here. Thank you in advance! Last week we visited this course. The people in the reception were extremely nice. My credit card got stuck in one of the ATMs in the club & the people in the reception were very helpful & made all arrangements for the recovery despite the fact the incident took place in the holidays. I really appreciate their help & hope to go back in the near future. The course was very challenging. Overall, our experience in the golf course was very nice. Nicest course I've played in Thailand. My caddie was excellant. Staff is well trained and most speak good English. Locker room is roomy and all facilities are upscale. Restaurnat has very wide range of food and reasonably priced. We played there in February and had two early morning rounds and loved it. 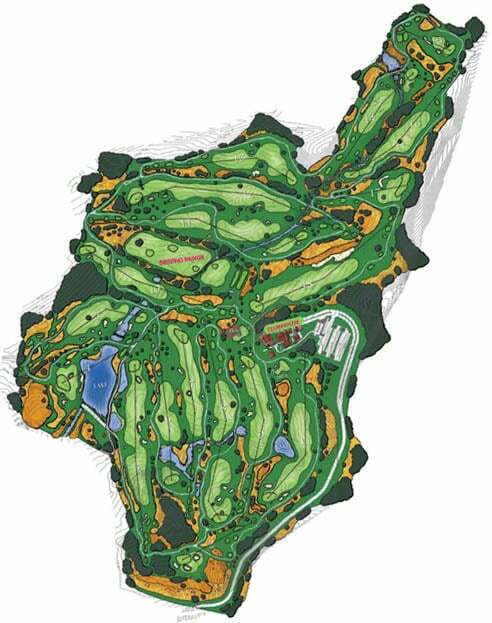 Fun course, well maintained, nice geography and great service. I plan to play Black Mountain next time I am down there but will no doubt play Banyan again. Brilliant club house for a cold few after the game. Banyan is seeing a little wear and tear around the edges as the course seemed a little dry and rough lee manicured than say at Black Mountain. nevertheless, Banyan is still my favorite Hua Hin golf course as it is in the most natural setting and has the best trained service staff. The course is in good condition and the greens fast and true. There are many short par fours that require mid to short irons off the tees and suit the higher handicap/short hitter. A resort course with little challenge for the better golfer. Caddies also very inexperienced with poor language skills. This course is a treat. Top marks to Stuart and Stacey for the job they have done/doing. The course is in immaculate condition, plays beautifully, sublte greens, well thought out design. The club house is spectacular as arethe view from Mulligans Bar and the restaurant. Fabulous, and the club suites are just something special. Thanks to every one at Banyan Estate.